This project was created on 10/07/2015 and last updated 10 months ago. The CAT Board is an OSHW Raspberry Pi HAT with a Lattice iCE40HX FPGA. It&apos;s meant to be programmed using the OSS myhdl, yosys, arachne-pnr, IceStorm tools right on the RPi. * Lattice iCE40-HX8K FPGA in 256-pin BGA. * 32 MByte SDRAM (16M x 16). * Serial configuration flash (at least 2 Mbit). * One 20x2 header with 3.3V, ground and 18 FPGA I/Os. * DIP switch with four SPST switches. * 5.0 V jack for external power supply. * 3.3 V and 1.2 V regulators. * Adjustable voltage on one bank of FPGA I/O pins. * 32 KByte HAT EEPROM. * 40-pin RPi GPIO header. Wrote a plugin for KiCad&apos;s PCBNEW that lets you paint pads of specific types. Prototyped a vertical HDMI connector and decided it wasn&apos;t worth it. 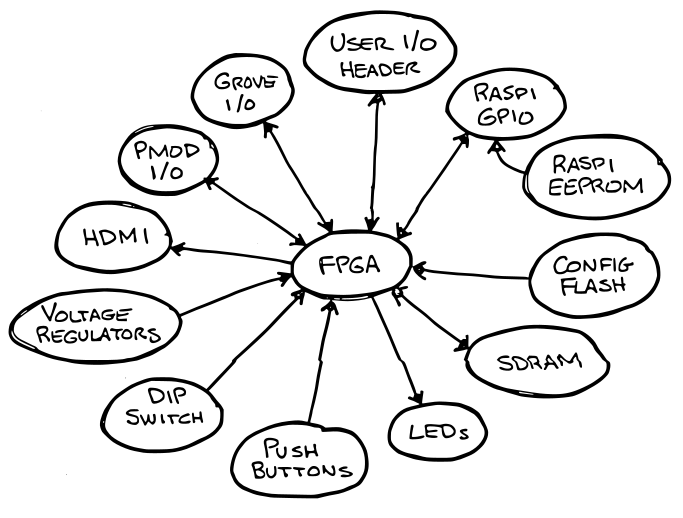 When you&apos;re dealing with FPGAs having several hundred or more pins, most of which are interchangeable, it can be perplexing when trying to choose the correct pin to connect to some other peripheral. You want to choose one that&apos;s close to where it will be connected, but you also need to make sure it&apos;s the right type (don&apos;t connect an FPGA VCC pin to an HDMI connector data pin), and it&apos;s in the right I/O bank. I wrote the PadPainter plugin for KiCad to highlight pads of ICs that meet a set of conditions such as the electrical function (input, output, bidirectional, etc.) and the bank (or unit) to which its assigned. This tool quickly shows me the pins of the FPGA which are candidates for connection to other peripherals. If you&apos;re dealing with large FPGAs or SOCs, this tool may also be useful to you. You can read more about it here. I decided to replace the SATA connectors on the original CAT Board with an HDMI port. Because of its location, the normal right-angle HDMI connector would be blocked by the USB ports of the Raspberry Pi. So I decided to use a vertical connector. Even so, I decided not to pursue this any further. The choice of suppliers for the connector was too limited and sketchy, and the assembly process looked like bent pins would be a problem. Instead, I&apos;ll use the more common right-angle HDMI connector and bring it off the same side of the PCB that&apos;s used by the Raspberry Pi GPIO connector. To make room, I&apos;ll need to replace the through-hole GPIO socket with an SMT version. Since SKiDL descriptions are just programs with a natural hierarchy, I modified SKiDL to pass that hierarchy to PCBNEW by embedding it into the sheetpath fields of the netlists it generates. Then I wrote a plugin for PCBNEW that would group and arrange the parts to reflect their position within that hierarchy. I still have to design the +3.3V and +1.2V voltage regulator circuits. After those are done, I can begin the detailed placing and routing. Created SKiDL modules for each of the blocks shown in my last log post, except for the power section. I still haven&apos;t selected the voltage regulators for that. Wrote a blog post describing how to do parameterized SKiDL modules for LED circuits. This is also directly applicable to the switch and pushbutton sections of the CAT Board. Released a version update for SKiDL that includes improvements motivated by the need to simplify/condense the SKiDL description of the CAT Board. Merged the SKiDL-generated netlist for the CAT Board with my KiCad template for Rapsberry Pi HATs. So I&apos;ve got my crap. I&apos;ve got my bag. Now it&apos;s a question of whether I can get all my crap in my bag. The current state of the CAT Board is stored in the skidlized branch of the CAT Board repository. While the conversion was easy, it&apos;s not exactly what I want. The resulting code is flat: just a list of component instantiations and nets to interconnect them without any hierarchical structure. Making changes to that is no easier than hacking on the actual netlist file. The actual hierarchy for the CAT Board is shown below. It isn&apos;t a deep tree: just a bunch of peripherals attached to a central FPGA. But my goal is to make a parameterized SKiDL module for each peripheral. Then I can build not only the CAT Board by interconnecting those modules, but reuse them in other designs as part of a circuit library. A simple example would be an LED module that instantiates multiple LEDs and current-limiting resistors based upon the width of the bus entering the module. So why did I bother making the flat version of the SKiDL code? Some of the motivation was to show the use of the netlist_to_skidl utility since it&apos;s an easy way to generate SKiDL for those used to working with schematics. In addition, the flat code also includes the detailed templates of the components used in the CAT Board. I can reuse those in my parameterized version. Rebuild the design using the SKiDL design language. Replace the power supply section with smaller LDO/switching regulators. Replace the large DC jack with a micro-USB connector that will be compatible with a Raspi power supply. Replace the SDRAM in the TSSOP-54 package with a smaller VFBGA version. Replace the two SATA connectors with an HDMI connector. Add the PCB slot for the Raspi camera flex cable. Rebuilding the CAT Board using SKiDL will guide me in adding features to make the language more expressive and concise. The remaining changes will improve the capabilities of the board while possibly compacting the circuitry enough so I can get all the components on a single side of the PCB. Also, I took advantage of a StickerMule special to get 50 vinyl stickers for just $9. It&apos;d be a shame to have these and no new board to go with &apos;em. It Just Keeps Getting Easier! Experimental open source micro-ecosystem for open FPGAs. Based on platformio. Apio is a multiplatform toolbox, with static pre-built packages, project configuration tools and easy commands to verify, synthesize, simulate and upload your verilog designs. The only thing I changed (besides the board identifier) was the "prog" entry to list the litterbox utility that uploads bitstreams from the RPi3 to the FPGA on the CAT Board. This just adds the command for uploading a bitstream using the litterbox utility. This does a sanity check to make sure the upload process for the CAT Board is occurring on an RPi2 or RPi3. I&apos;ve been away from this project for a few months (OK, four months) building things like a new tool for designing electronics. One of the things I haven&apos;t discussed here is the time it takes to download a bitstream to the FPGA on the CAT Board. As shown in previous logs, the FPGA is configured through one of the hardware SPI ports of the RPi. I&apos;ve never considered SPI a very fast way of transferring data, so I initially set the port bit rate at 1 Mbps. That was good enough to get the FPGA going within a couple of seconds and there was no reason to push it and possibly cause errors while I debugged the board. The download to the FPGA completed more quickly than before and the LED started blinking. Success! Then I started pushing for more: 10 Mbps, 20 Mbps, 50 Mbps, no problem; 100 Mbps, 150 Mbps, still five-by-five; 200 Mbps, complete and utter failure. OK, I hadn&apos;t expected to get even close to 200 Mbps. With a little trial and error, I finally found the maximum speed I could use was 199,999,999 bps. The reason for that becomes clear later. As can be seen, the actual transmission speeds are quite a bit lower than the speed setting. The reason for that is the overhead in the python-spi module that copies and converts the individual 4096-byte packets of the payload before sending them to the SPI driver. Even though each packet gets transmitted at a high clock speed, there&apos;s a significant "dead time" (2.3 ms) while the software readies the next packet. As the raw speed increases, the packet transmission time decreases and the dead time (which stays constant) consumes a larger percentage of the time to send the full payload. That&apos;s why the duty cycle decreases as the speed setting increases. The data payload is checked and no conversion or copying is done if it is already in the form of a string of bytes. The address of the current packet within the payload is sent to the SPI device driver rather than making a copy of the packet. After these two changes, setting spi.speed to 100 Mbps resulted in an actual transmission speed of 65 Mbps (an increase of 540%). A transfer rate of 65 Mbps opens up some interesting possibilities. That means there is an 8 MByte/second channel between the CAT Board FPGA and the RPi that uses only a few pins of the GPIO connector. I have some Xilinx-centric VHDL modules and a Python library that provide a printf-like debug interface for FPGA designs through the JTAG port. I can modify these to use the SPI port so the CAT Board + RPi will have the same capabilities. I&apos;ll be working on that next. I think. Maybe. Getting to Blinky, MyHDL Style! In my previous post, I showed how to blink an LED on the CAT Board using Verilog. Now I&apos;ll do the same thing using MyHDL, a hardware description language based on Python. I&apos;ll assume a starting point of a Raspberry Pi running the Raspbian OS with the yosys, arachne-pnr and icestorm FPGA tools installed. If you&apos;re following along and haven&apos;t already got that, read the previous post. The stuff I describe here won&apos;t work without it. Blinking an LED with Verilog wasn&apos;t hard, and doing it in MyHDL isn&apos;t either. Here&apos;s the source code that&apos;s stored in a Python file called blinky.py. # Define the Blinky module. cnt = Signal(intbv(0, 0, 50000000)) # Counter from 0 to 49999999.
tgl = Signal(bool(0)) # Toggle flag drives the LED. # Sequential block triggered on every rising edge of the clock. cnt.next = 0     # Reset the counter. else: # Counter hasn&apos;t reached max so just keep incrementing. # Return a reference to the Blinky logic. # Define the connections to Blinky. # Create an instantiation of Blinky. # Output Verilog code for Blinky. This translates the MyHDL code into Verilog that&apos;s stored in the blinky.v file. Then this Verilog file can be compiled into a bitstream using the yosys, arachne-pnr and icepack tools just like in the previous post. Once the bitstream is downloaded to the CAT Board, the LED will blink. Why bother doing this in MyHDL? It just adds another step, but does it add any value? In this case, no, it doesn&apos;t. Because this design is so simple, the MyHDL code isn&apos;t any more compact or expressive than the original Verilog. The value of MyHDL is experienced when doing design exploration, i.e. trying various approaches to solving a problem. Then all the features of the Python ecosystem can be used with MyHDL to come up with a solution. I showed a few examples of this here and here. Getting to Blinky, CAT Board Style! A fundamental rite of passage is getting your embedded system to blink an LED. In this post, I&apos;ll show you how to take a Raspberry Pi 3 fresh out of the box and get an LED blinking on the CAT Board. Get the Raspbian OS for the RPi and unzip it on the PC. To write the OS image to the SD card, get the Win32DiskImager and install it on the PC. Look in Network Connections to find the IP address of an Ethernet port the RPi can attach to. Save the cmdline.txt file and eject the SD card from the PC. Insert the SD card into the RPi. Connect the RPi to the PC&apos;s Ethernet port with a cable. Apply power to the RPi and let it boot up. To talk to the RPi using SSH from the PC, get PuTTY and install it. Login to the RPi using the account "pi" and the password "raspberry". You can do everything over the wired Ethernet, but I prefer the convenience of using my local wireless network. Now disconnect the Ethernet cable and use PuTTY to SSH into the RPi over the wireless network using the IP address found in the last step (192.168.0.103). Sharing files between my PC and the RPi lets me use a familiar editor to write source that can then be dropped onto the RPi. Finally, close raspi-config and reboot the RPi to let the changes take effect. During development or when the FPGA is being used dynamically, the RPi has to be able to load a configuration bitstream into the FPGA. After development is completed, the RPi may want to store the finished FPGA bitstream into the flash. When the CAT Board is used stand-alone or when the FPGA performs some fixed function for the RPi, the FPGA has to be able to configure itself upon powerup with the bitstream stored in the flash. All three modes have to share a single SPI bus between all the devices while using a minimum of RPi GPIO signals and extra circuitry. Mode 3 is the easiest: when the FPGA powers up (or is reset), it checks to see if the SPI CS line is pulled high and, if so, becomes an SPI master and reads its configuration bitstream from the flash. The RPi GPIO signals are hidden behind the series resistors and can&apos;t interfere. Mode 2 is slightly more difficult. When the RPi is storing a bitstream by sending it to the flash chip&apos;s SI input, the SPI CS line is pulled low. But that also enables the SPI interface of the FPGA which could lead to interference if the FPGA&apos;s SDO output becomes active. To prevent this, the RPi asserts the reset pin of the FPGA so its SPI port can&apos;t turn on. Problem solved. Mode 1 is the most difficult. The RPi pulls the SPI CS line low as it removes the reset from the FPGA. This places the FPGA in slave mode so the RPi can send a bitstream to the FPGA&apos;s SPI port. But this also enables the flash chip&apos;s SPI port, which means the flash&apos;s SO output could interfere with the bitstream data. Unfortunately, there&apos;s no reset pin on the flash to keep it quiet. However, the flash does have a deep power-down mode that is entered by sending a specific command to the flash. Once in this state, it will not respond to anything until it receives another specific command to wake up. The RPi can then transfer the bitstream to the FPGA. During the transfer, there&apos;s no chance the wake-up command will be sent accidentally to the flash&apos;s SI input because 1) neither the RPi or FPGA will be driving that signal line during the configuration process, and 2) the flash only executes a command once its CS input goes high but the SPI CS line is held low for the entire duration of the bitstream transfer. So the flash will stay quiet and the RPi can send the bitstream to the FPGA in peace. Another complication of the shared SPI bus is that the roles of the RPi&apos;s MOSI and MISO pins are reversed in modes 1 and 2. In mode 1, the RPI&apos;s MOSI output pin drives the SDI input of the FPGA and the FPGA&apos;s SDO output drives the RPI&apos;s MISO input. That allows the hardware SPI port of the RPi to be used for the SPI transactions. But in mode 2, the RPi&apos;s MOSI pin acts as an input to receive data from the flash&apos;s SO output and the RPI&apos;s MISO pin has to drive the SI input pin of the flash. That precludes the use of the RPI&apos;s SPI hardware and the SPI transfers to/from the flash have to be done using bit banging. I searched for a ready-made SPI bit-banger program but nothing great popped up. So I just wrote one in Python using the RPi.GPIO library. It consists of a class for handling individual pin I/O, another class for SPI transactions, and a final class that handles most of the commands for the serial flash chip. To test the code, I first tried the command to read the device ID from the flash. The manufacturer and device IDs should have been 0x1F and 0x8401, respectively. Instead, I got 0xFF and 0xFFFF. That&apos;s OK; nothing ever works the first time. I probed with an oscilloscope to make sure the RPi was driving the correct pins of the flash. No problem there except that the SO pin was always high (naturally). Do you have an update on whether you will be selling these and pricepoint? No, I really don&apos;t have any plans for selling this. Lattice sells $22 iCE40 boards and Olimex has one for $25. Even though these use a small HX1K FPGA, they kind of set the price point of what people are expecting. Earlier this year, I calculated the part cost of the CAT Board with an HX8K at $17. Even if I could sell it at $50, I&apos;d make almost nothing and still not many people would buy it. It&apos;s open source, though, so feel free to build your own. Hi Dave, very cool project. I have actually been working on similar project off and on for a while with a Xilinx FPGA. Glad to see that I am not the only one who had the idea of pairing the pi with FPGA. I haven&apos;t posted anything yet but I might in the future. Just a quick note based on an earlier comment where you mention the SPI as being slow. I&apos;m using this library (http://www.airspayce.com/mikem/bcm2835/index.html) to control the SPI interface. My very rough calculations put the transfer rate at about 3 Mbit/s when I&apos;m loading my bit file, and it can probably be pushed a bit faster. I can share some code if you&apos;re interested. Hi, Mike. Thanks for the reply. I actually sell the StickIt!-MB (http://www.xess.com/shop/product/stickit-mb-4_0/) that mates one of my XuLA Xilinx FPGA boards to an RPi. The only problem with that is I can&apos;t run the Xilinx programming tools on the RPi. Have you been able to do that? In regards to the slow SPI, that&apos;s a problem only when I program the flash by bit-banging to arbitrary GPIO pins using Python. When I use the actual hardware SPI of the BCM2835 to program the FPGA directly, it&apos;s incredibly fast. I looked at the library you mentioned and it appears to only provide an interface to the hardware SPI port. Is the library also able to bit-bang to any set of GPIO pins? Damn nice project! Funny name, just happen to have finished a etherCAT project :P (8 layer pcb from multi-circuit-boards.eu -> 5 boards 150 euro without stelcil ). I used a hot air gun (actually, it&apos;s a paint remover) because that&apos;s what I have. A few years ago, I made a video about how to solder BGAs. It&apos;s not that hard to do. Hi, Sami. The CAT Board isn&apos;t available for sale at this time. I&apos;m still considering whether that would be worthwhile. The main limitation of the CAT Board is the slow interface to the RPi through the GPIO connector. I would like to get and test one of your CAT FPGA board for Raspberry Pi 2 B. How can I order one from you? Have you found any limitations in your CAT board? You are about to report the project "CAT Board", please tell us the reason.